Today I'm showing you Chemistry 517. 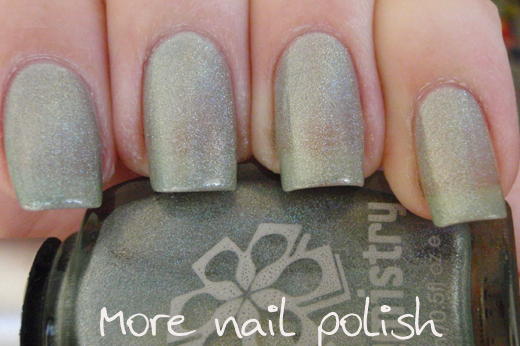 Recently piCture pOlish got 517 in stock in the Ozotic range, but as I had this version, I didn't need the other. This is supposedly the green holo, but it is such a pastel green that it is almost a silver holo. I have previously posted about Artform 517 too, which again is another dupe - although no longer name under that name. I believe Glitter Gal Holographic Green is a dupe too. While the green in this is a little disappointing, the holo certainly isn't. It's super holoy goodness at it's best this one! 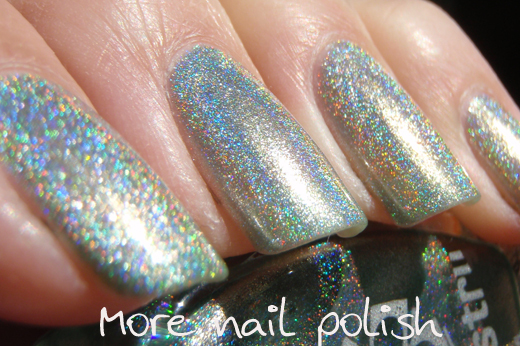 It's very sheer too, so you could use this as a holo top coat over other polishes. Indoors below you can see that even with three coats there was still VNL. I gave my nails a file down this morning. The left hand that is, the right hand is still nubbin city. I finally feel like I have found the right length for my nails. It's funny, I look back at some of my earlier blog posts and look at the length of my nails and think they are ridiculously long. So now my nails are a mm or two shorter than they are in these pics.